Step-by-step instructions determining what to keep, what to toss, what to add and how to organize it all. Plus, our 15 wardrobe essentials. Getting dressed is about to get a whole lot easier. → Is it good quality? → Do I wear it often? If you answered yes to any of the above, keep it! If not, it’s time to start sorting. Try on anything you’re unsure of to make sure it actually fits and isn’t too tight, stretched out or baggy. You’ve probably heard this before, but if you haven’t worn it in a year, you probably never will. If something is new or gently worn, bag it up to donate or sell. LBD, cottonon.com, $25. White tee, americanmadesupplyco.com, $24. Trousers, liverpooljeans.com, $89. Blazer, kennethcole.com, $135. Midi skirt, lulus.com, $48. Moto jacket, American Eagle Outfitters, ae.com, $100. Crew neck sweater, everlane.com, $100. Long cardigan, oldnavy.com, $50. Chambray shirt, mott50.com, $78. 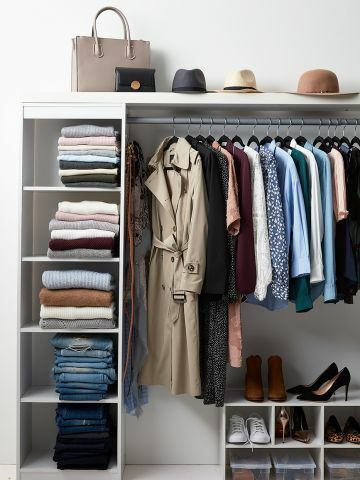 Jessica Grabler, fashion stylist and organizing expert, shares how to design the most functional—and pretty!—closet. → Always fold sweaters— hanging stretches them out. → Separate clothing by style to simplify finding what you need. → Fold and stack jeans, then organize by cut or wash.
Want more ways to maximize your space? IKEA, California Closets and The Container Store are a few companies that can help you create the closet of your dreams. Trench coat, londonfog.com, $165. Booties, thursdayboots.com, $169. Pumps, mgemi.com, $278. 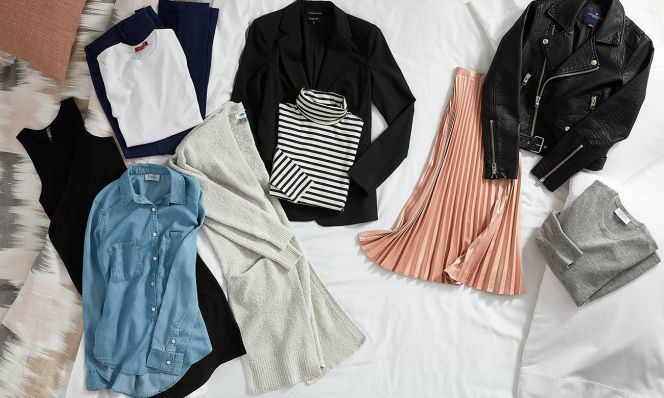 “Update your closet at least twice a year,” says Rachel Parcell, founder of the style blog Pink Peonies. Spring and fall are good times to evaluate what you have and what you’re missing. At the start of each season, identify two or three trendy items that you love and would be a good addition to your wardrobe. “People tend to splurge on special-occasion attire that they rarely wear,” says Rees. 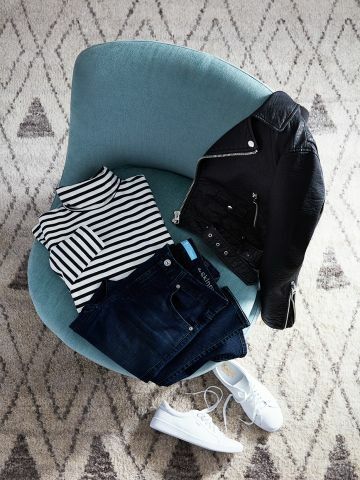 Get more bang for your buck by investing in the everyday items you know you’ll wear again and again, such as flattering jeans, a cozy sweater and classic black pumps. The b(air) jeans from 7FAM (pictured above) have the look of denim and the comfort of leggings. Like a second skin, these perfect pants are sleek and slimming. After a closet cleanup, it’s time to get rid of the excess. You have two options: Donate to a local charity or sell your items through a website or app. Here are some of our faves. Solve last-minute wardrobe mishaps with these quick fixes.